I always enjoy the air of anticipation this time of year, less than a month away from the announcement of the 2013 Man Booker Prize Longlist in London on July 23. Obtaining the over one hundred eligible books is a challenge for the American reader, as many books are not as yet distributed in the States. However, because of several wonderful bookstores that I frequent and a great local public library, I have managed to find and read five of the eligible books so far. All five are excellent novels, and I recommend all of them to you. English writer Jim Crace’s Harvest is set in an unnamed English village in the unspecified distant past. It’s a spellbinding mood piece, layered with plot twists and a fascinating array of characters that reflect the class and caste structure of the time. Crace’s pacing of the narrative is first rate, as is his lyrical writing style. Colm Toibin, the outstanding Irish writer, has produced a short literary gem in The Testament of Mary. He chronicles the thoughts of Mary of Nazareth in her last years residing in Ephesus. Mary is depicted as a mournful mother, confused about the meaning and purpose of her son’s life and the turbulent aftermath of his death. Her ambiguity about the deity of Jesus is contrasted with the unquestioning faith of some of the Apostles who care for her. The Pakistani author, Mohsin Hamid, dazzles us with his satiric novel, How to Get Filthy Rich in Rising Asia. The setting is an unspecified South Asian nation, but it is crystal clear that Hamid is dissecting the social and commercial fabric of his homeland, especially life in the big cities of Lahore and Karachi. The novel is fraught with ironies and contradictions, much like Pakistan itself. Although I found some superfluous bathos in the storyline and characters, in its entirety the book manages to be an entertaining and satisfying read. Ghana Must Go is the debut novel of Taiye Selasi, a woman born in London, raised in the States, to parents born in Nigeria and Ghana. It’s a splendid depiction of both the psychological and emotional struggles of an immigrant family in the United States, as well as life in post-colonial West Africa. Selasi’s characters are nuanced, and she unrelentingly probes their minds until suppressed emotions and feelings are revealed. Finally, Irish author Colum McCann covers 165 years of Irish and American history in his amazing novel TransAtlantic. The construct of the book is brilliant. He weaves actual historic events such as Frederick Douglass’ fundraising trip to Ireland at the onset of the Great Famine and former Senator George Mitchell brokering the Good Friday Accords into the fabric of his incredible fictionalized narrative. It is historical fiction at its best, allowing us to see how troubled pasts can eventually lead to hopeful futures. Ben Hecht’s impact on the Chicago journalistic scene was monumental. His memorable A Thousand and One Afternoons in Chicago columns, written in the Roaring Twenties for The Chicago Daily News, and eventually published as a book, describe ordinary Chicagoans in ordinary situations in the most extraordinary picturesque language. They were highly influential on the future style and content of Mike Royko. L. Frank Baum—the writer of the Oz books. Edna Ferber—author of memorable novels, including So Big and Cimarron. 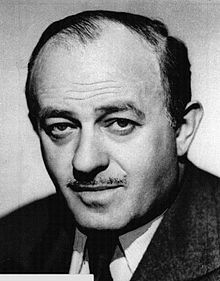 Ben Hecht—Great Chicago journalist and prolific screenwriter. Leon Forrest—Author of the novel, Divine Days, sometimes referred to as the African-American War and Peace. John Johnson—Publisher of Ebony and Jet magazines. Thornton Wilder—Playwright (Our Town, The Skin of Our Teeth) and novelist (The Bridge of San Luis Rey). The induction ceremony will be in the late Fall at a venue to be determined. I would love to see some posted comments on these new inductees. This year’s Bloomsday at the Cliff Dwellers has an added enhancement. 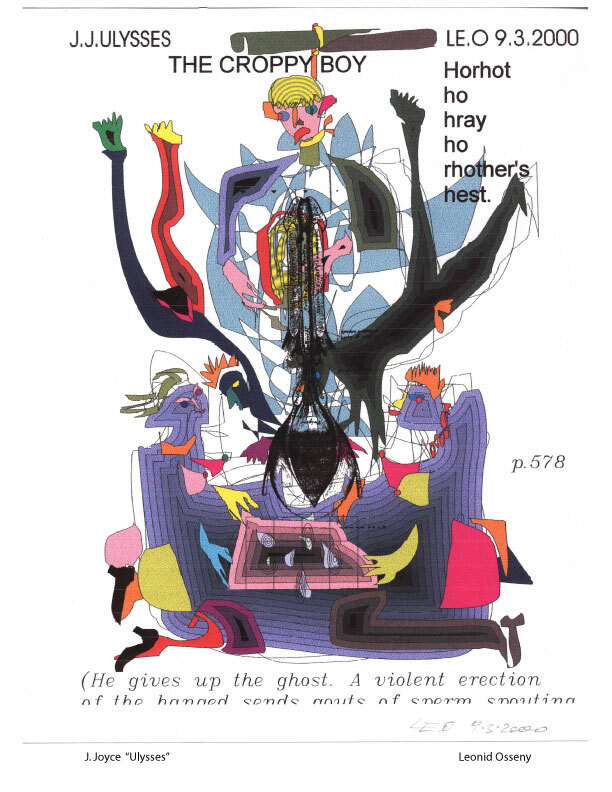 Internationally acclaimed artist, Leonid Osseny, will showcase the illustrations that he has done on each chapter of Ulysses. These were the same pieces that were exhibited at the Joyce Center in Dublin during the Bloomsday Centennial in 2004. So join Leopold, Molly, Buck, the Croppy Boy and others as we ring in Bloomsday 2013 at the Cliff Dwellers! For additional information check out http://www.cliff-chicago.org. Chicago is honoring one of its own, the late, great poet Gwendolyn Brooks, with a celebration of her life and work on Friday, June 7, 2013. The event is being called Brooksday, and 100 individuals from the civic, educational and cultural communities in Chicago will read from the body of her work. The readings will take place at the Chicago Cultural Center from 9:00 am until 7:30 pm. Brooks was the first African American recipient of the Pulitzer Prize for poetry, and was the Illinois Poet Laureate for many years.